Home Unlabelled Nagababu - Tower star.. Fan of Power Star! Nagababu - Tower star.. Fan of Power Star! The impact and craze of Pawan Kalyan among the masses and youth audience is known to all. The cult of Pawanism is spreading all across and a mania is developing. Till there it is fine but here is an interesting byte. It looks like his own family members are now becoming his fans and one man to mention is Nagababu. Till now, Nagababu has always been referred as mega brother but now he has changed his title to ‘Tower Star’. This is coming up due to the latest release ‘1000 Abaddalu’. 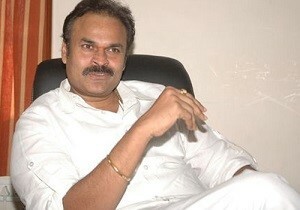 Nagababu proudly proclaims with a dialogue ‘Tower Star…fan of Power Star’ in the film. So, it is not just the likes of Nithiin or any other star even Pawan Kalyan’s own elder brother is stating he has become power star fan. ‘1000 Abaddhalu’ got a negative talk but whenever Nagababu gave that dialogue there were whistles and screams in theatre.